We would like to wish everybody a Happy New Year and to let you know that Striding Out is celebrating it's very first award of the year today! 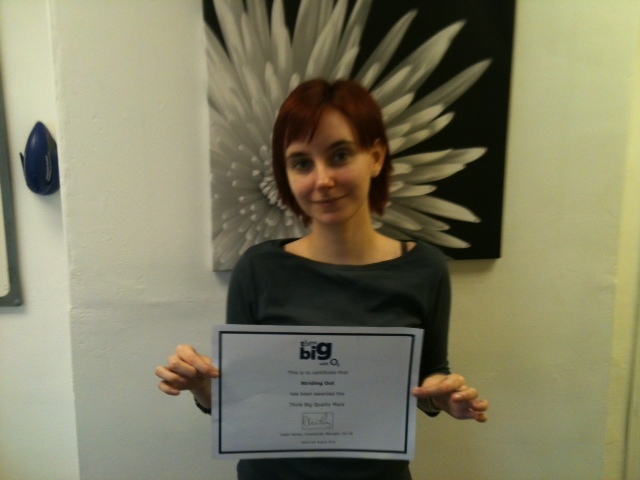 We were awarded with the Think Big Quality Mark for our sucessful work on the community coaching programme. Over the course of the next year we will be supporting more young people to secure funding for their community based ideas. It looks to be an exciting 2013! We are delighted to congratulate our coach Heather Wilkinson on the birth of her beautiful daughter Lucie Anne! She was welcomed into the world at 16:45 pm on the 11th Nov, weighing 6.3 lb. Are you unemployed and looking to boost your CV with a qualification? Do you aspire to lead in the workplace? If yes, then join our Aspire to Lead program…. The Aspire to Lead course is designed for new and aspiring team leaders aged 20 and above, and provides an in-depth introduction to the role and responsibilities of a team leader. The course begins on Monday 19th November between 10.30am -3.00pm and will be delivered two days a week for four weeks. The course is being delivered by professionally qualified coaches who also have substantial experience as team leaders. Their approach is to make the course practical, fun, and engaging. training and tutorial sessions and completion of a workbook of reflective activities to complete the necessary assignments to achieve the qualification. This course is open and free to individuals who meet ALL of the following eligibility criteria. Please note a copy of necessary evidence will be required on the day by the trainers. Not currently participating in any other training course. We are delighted to announce that Elaine Owen has taken on the role as the new CEO at Striding Out CIC, as of the 1st October 2012. Elaine will be supported by her dedicated delivery and support team to continue Striding Out's coaching and training services on a national scale to help individual's stride out to success. Elaine takes over from Heather Black (nee Wilkinson), who founded Striding Out CIC in 2005. Since it's launch the organisation has helped over 13,000 individuals, especially young people aged 18-30, develop new confidence and skills, delivering over £2.5m worth of contracts for education, third and public sector organisations across the UK. If you would like to contact Elaine about new business development opportunities please email elaine@stridingout.co.uk. Striding Out can offer start-up funding of up to £2800 to young people aged 18-25 who are starting a business, which positively supports their their local community. For example we have provided start-up funding to 1) a personal trainer to buy equipment who was running exercise sessions for disabled children and 2) a events organiser who is running events to showcase talented youth. To access the funding your idea must match the above criteria and you should be ready to market test your business idea and/or start your business. You must also be eligible and ready to take up our Training and One to One Business Support Package detailed below. We can offer a tailored 12hr one to one support package with a range of expert advisers to help skill you up and handle the many aspects of of starting a business. The support is focussed on young people who are ready to launch their business and other eligibility conditions do apply. If you are therefore interested in this support please click here to apply so we can assess your suitability and eligibility for the programme.